Just as a smile is said to be the best face lift, good posture may be the single best thing you can do to improve your overall physique. It's not just about appearance, either. Bad posture is the result of some muscles being too tight and others being too weak. These imbalances can set of a chain reaction in your entire musculo-skeletal system, resulting in pain, nerve damage and loss of functionality. While we tend to think of postural problems as an upper body issue, they're really quite democratically distributed from the crown to the toes. But the shoulders and upper back are a great place to start on the road to good posture. 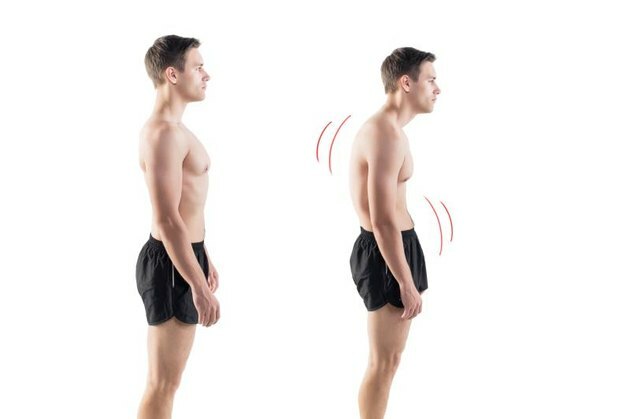 Posture is best restored gently and gradually, beginning with isometric exercises before progressing to more challenging exercises that involve weights. 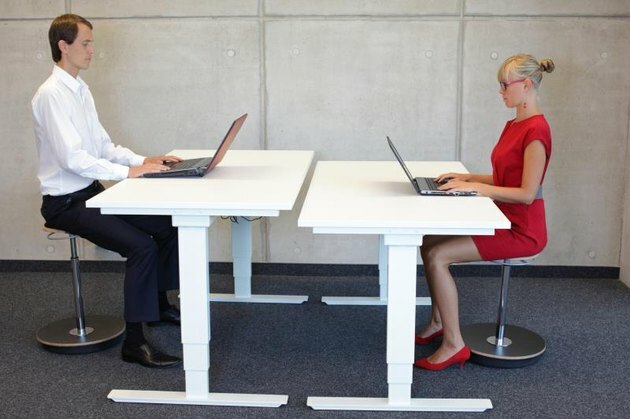 Read More: Why Is Posture Important? Shoulder squeezes work the rhomboids and the middle trapezius muscles, which extend downward several inches from the below the neck and across to the shoulder tips. How To: Stand with your feet at hip width and raise your arms to your sides so they're at shoulder height. Bend your elbows so that your forearms are at a 90-degree angle. Slowly move your elbows back while squeezing your shoulder blades, making sure you feel the muscle contraction in your back. Hold for 3 seconds. You can also do this exercise sitting. The robbery pinch targets the lower trapezius, which exerts a downward force on the shoulders, keeping them from shrugging upward. How To: Rest your lower abdomen on a Swiss ball with your chest protruding over the top. Point your elbows toward your back pockets and squeeze your shoulder blades together. Hold for 3 seconds. For an advanced version, hold light dumbbells. When combined with contraction of the abdominal muscles, low row wall activates the serratus anterior and the upper trapezius muscles, both important for posture. How To: Standing with your back against a wall, fan your arms out side to side at shoulder height. Contract your abdominal muscles and press your fingertips into the wall. Hold for 3 seconds. Airplanes strengthen the muscles surrounding the shoulders -- between the scapulae, and those in the upper part of the back. How To: Lie on your stomach with your toes pointed inward toward each other. Stretch your arms out perpendicular to your torso with your palms down. Lift your head, arms, shoulders and upper back off the floor. Once elevated, fan your arms back until you feel the flexion. Seated row is a great all-around back exercise that works most of the "synergist" muscles up and down the spine. How To: Sit on the bench of a row machine. Pull the handles into your breast bone while squeezing your shoulder blades together. Extend your arms, allowing your shoulder blades to protract fully. Be sure to keep your elbows tucked throughout the exercise. As the name suggests, lat pull downs work the latissimus dorsi. Because they connect the spine to the humerus, the lats can cause shoulder problems, so fully extending your arms at the peak of the exercise is important for keeping them stretched out. How To: Hold the cable bar of a lat pull-down machine with both hands using a wide grip. Sit with your thighs under the supports. Pull the cable bar down as far as your upper chest. Slowly release your arms upward until they are fully extended. Push-ups help straighten your back in many ways. In addition to strengthening the shoulders, they enhance core stability and stabilize the lower back. How To: Lie face-down on the floor with your hands at shoulder width or slightly wider. Pushing straight up, use your arms to lift your body off your floor. Maintaining a straight back, bend your arms and lower slowly to the floor. As anyone who embarks on a fitness regimen quickly discovers, everything is connected. While your postural problems may be most visible in your upper body, core muscle groups such as the abdominal muscles and glutes also play a key role in supporting good posture and a well-balanced gait. So in addition to upper body exercises such as those mentioned above, be sure to round it out with crunches, leg lifts and planks that will provide a strong core.